The values of using Primo Natural Lump Charcoal for Primo Ceramic Barbecue Grills over charcoal briquettes are almost immeasurable. First of all, natural charcoal is made from real, untreated wood. That means that there are no chemicals, no tars, and no unnatural ingredients that can add chemicals to your food and affect the flavor. Natural charcoal is lighter, easier to start, and burns hotter and longer than briquettes. If you're using a Primo ceramic grill, using other charcoals can cause chemicals and odors to be absorbed into the ceramic and permanently taint the grill. Using a precision instrument means using the right fuel. Treat your ceramic grill like the special item it is by using Primo Natural Lump Charcoal for Primo Ceramic Barbecue Grills for all of your grilling needs. WARNING: Burning charcoal in this product can expose you to checmicals including carbon monoxide which is know by the State of California to cause birth defects or reproductive harm. For more information go to www.P65Warnings.ca.gov. 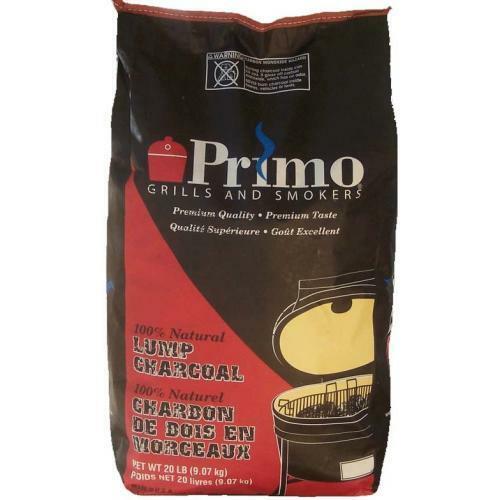 Having tried a number of charcoal products, I can say that Primo is far superior to any lump charcoal brand I have used. Though a little more expensive, Primo is well worth the money. I had a disappointing experience with this charcoal. Upon purchase, I expected it to be superior to typical brands. However, I was disappointed because I found that it did not work well on my kettle grill. Per the instructions, I used chimney starter. Unfortunately, I found this to be a mistake because the charcoal burned out quickly, leaving my food undone and me with no option but to use my other grill. Even economy priced brands like briquettes are a cut above this substandard charcoal. It is possible that using this charcoal with a Primo grill would bring better results, though. I found the chunk sizes to be inconsistent. Some were large and some were too small. Also, the charcoal is fragile, and does not lend itself well to the recurrent use that was advertised. The pieces broke easily so I could not reuse them. Overall, I found the charcoal substandard and the price high. Iâ€™ve found that Primo charcoal chunks are pretty consistent in size. I tried another brand and learned quickly how much better Primo is! Some of the other brandâ€™s chunks were so big I had to cut them down in size! Primo gives you food that tastes great and also has coals that are consistent in size for better heating. I found that this charcoal works particularly well with high temperature cooking. I turned my grill temperature to a high setting and was pleased with the results. The steaks turned out great and the grill temperature increased rapidly. I have not done any low-temperature cooking with this charcoal yet. This charcoal is superb. Ingrained with hardwood and compatible with a Kamado oven, this is an excellent choice. I love the smell! This is great charcoal, and I appreciate the fact that itâ€™s made here in the USA. Iâ€™ve bought charcoal from another company before and found that there was lots of charcoal dust and that some of the pieces were way too bigâ€”some as big as half a loaf of bread! I noticed, though, that that brand was made in Mexico. The Primo charcoal lights up fast, has very little dust, and burns hot. Iâ€™ll be using it from here on out! Great Charcoal for Use with a Primo Grill! "This is excellent charcoal to use in conjunction with a Primo grill. I have been very pleased with this product. Having used regular charcoal with different brand grills, I can say confidently that this charcoal is far superior. And I have realized that the right kind of charcoal makes a huge difference. I have found that the food retains its moisture and tastes much better.